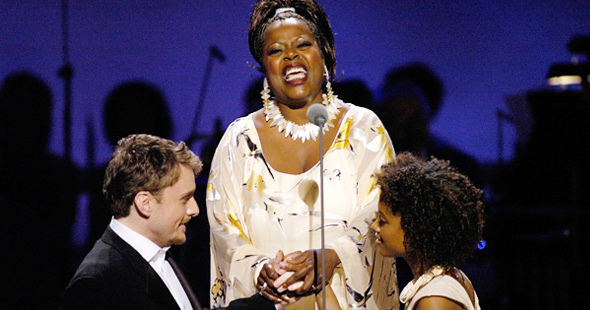 “SOUTH PACIFIC” IN CONCERT FROM CARNEGIE HALL premiered on April 26, 2006 on PBS (check local listings). “South Pacific” was among Rodgers and Hammerstein’s most successful and critically acclaimed shows, winning nine Tony Awards®, including Best Musical, in 1950. Although its first Broadway revival will not occur until the 2007-08 season (when it is presented by Lincoln Center Theater), “South Pacific” has lived on in thousands of productions, both professional and amateur, over the years, as well as in two movie versions. Learn why “South Pacific” had to be a hit for the duo and the difficulties they encountered in presenting the controversial theme at the heart of the musical in the essay by contributor Thomas Hischak. See all the numbers from the musical in the song list, which includes links to video excerpts from the concert performance. Find photos from the original production in the Multimedia Presentation, and read an interview with musical theater star Brian Stokes Mitchell. Special funding for the program was provided by The Rodgers Family Foundation and The LuEsther T. Mertz Charitable Trust.